Local musical highlight of the year. 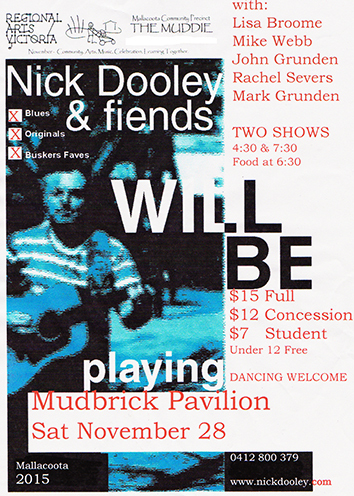 Mallacoota’s finest musicians support renowned folkist and bluester Nick Dooley. Rachel Severs’ debut on the upright acoustic bass. Entry: $15 Adult, $12 Concession, $7 Student, Under 12 years free. ‘THE MUDDIE’ Mallacoota Mudbrick Pavilion. Tucked away on the coast near the border of NSW and Victoria, ‘The Muddie’ Mallacoota Mudbrick Pavilion was built in the seventies using local materials and community labour. Originally built as a sports pavilion it has been transformed over the years into a warm friendly venue for community celebrations, arts events, sporting fixtures and education, and is managed by a committee of volunteers. After two years of consultation and planning, The Muddie has recently had a strategic redevelopment plan accepted by the East Gippsland Shire and has been granted 1.5 million dollars to up-grade the hall and surrounding facilities. ← Mallacoota, Victoria, Community Music Open Mic Jam.